When I teach Writing Historical Fiction to school students, I first give them a whole raft of pictures of people’s faces of many eras, pulled from all kinds of sources. I get them to pick the picture of a face they ‘like’ – one that appeals to them for any reason – then their first assignment is to create a frame for the picture, then name the subject. That person will be their main character. In a similar exercise, when I first start a story I go in search of a face to represent the main character. In this case, I selected this person to be a stand in for my character Rowena Cole. (She is fact, Nancy Talbot Clark, the first women to graduate from medical school in the US in 1852). I like the vulnerable, but somewhat determined look in her eye. 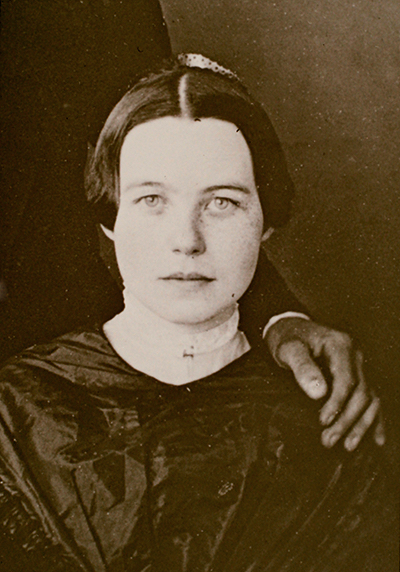 The plainness of her hair, and for the purposes of writing THE ROUGH DRESS, the man’s hand on her shoulder which conveys an element of the story. 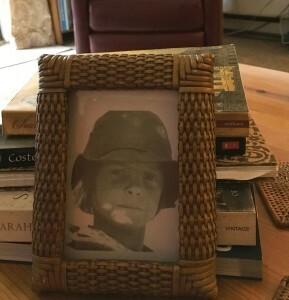 I will probably print out her picture, and put it in this frame, the same one I used to house the picture of Elsie Miller, the main character in my midgrade historical novel SILVER RAIN. If Nancy Talbot Clark could overcome all kinds of obstacles to forge a career in medicine, I can surely write 50,000 words!